After it was first domesticated from the wild teosinte grass insouthern Mexico, maize, or corn, took both a high road and a coastallow road as it moved into what is now the U.S. Southwest, reports aninternational research team that includes a UC Davis plant scientistand maize expert. The study, based on DNA analysis of corn cobs dating back over 4,000years, provides the most comprehensive tracking to date of the originand evolution of maize in the Southwest and settles a long debateover whether maize moved via an upland or coastal route into the U.S.
Study findings, which also show how climatic and cultural impactsinfluenced the genetic makeup of maize, will be reported Jan. 8 inthe journal Nature Plants. The study compared DNA from archaeological samples from the U.S.Southwest to that from traditional maize varieties in Mexico, lookingfor genetic similarities that would reveal its geographic origin. "When considered together, the results suggest that the maize of theU.S. Southwest had a complex origin, first entering the U.S. via ahighland route about 4,100 years ago and later via a lowland coastalroute about 2,000 years ago," said Jeffrey Ross-Ibarra, an associateprofessor in the Department of Plant Sciences. 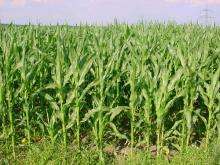 The study further provided clues to how and when maize adapted to anumber of novel pressures, ranging from the extreme aridity of theSouthwest climate to different dietary preferences of the localpeople. Excavations of multiple stratigraphic layers of Tularosa cave in NewMexico allowed researchers to compare genetic data from samples fromdifferent time periods. "These unique data allowed us to follow the changes occurring inindividual genes through time," said lead author Rute Fonseca of theUniversity of Copenhagen. Researchers used these data to identifygenes showing evidence of adaptation to drought and genes responsiblefor changes in starch and sugar composition leading to thedevelopment of sweet corn, desired for cultivation by indigenouspeople and later Europeans.